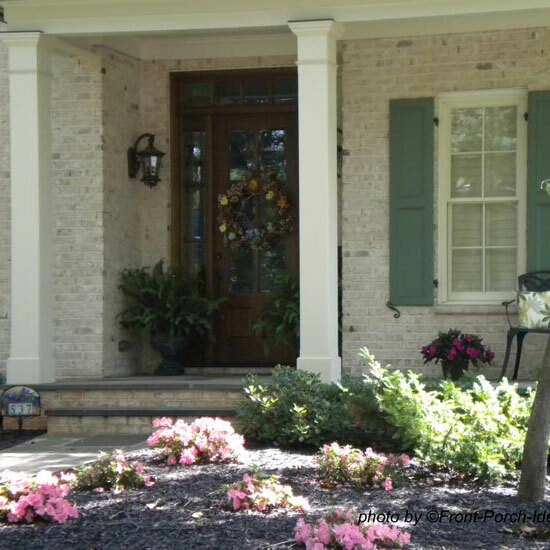 Often a homeowner is faced with a lawn drainage problem near their front porch or other area of your yard. 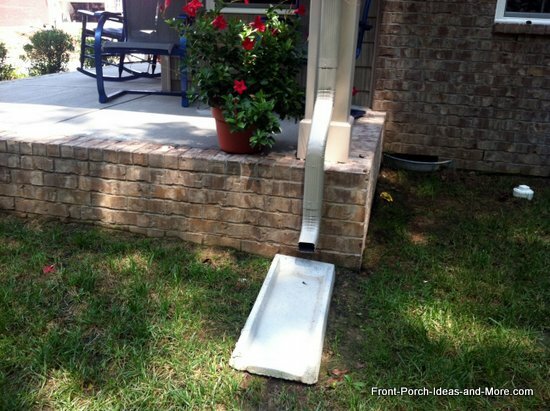 Many landscape drainage issues can be resolved by directing water from adjacent down spouts away from the porch. However, there are cases when that is not feasible as when the yard has no slope. 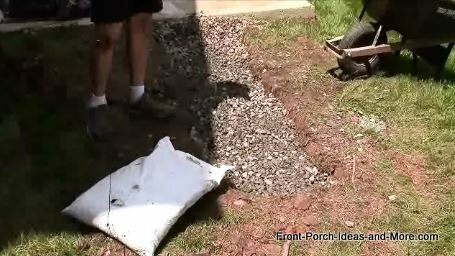 In such cases you may want to consider constructing a type of French drain. Important Note: Call your utility companies and Cable Company to mark the lines before you dig. No one wakes up thinking they are going to have an accident that day. You may be surprised at how many lines and pipes you have under your yard - be safe and have them marked. 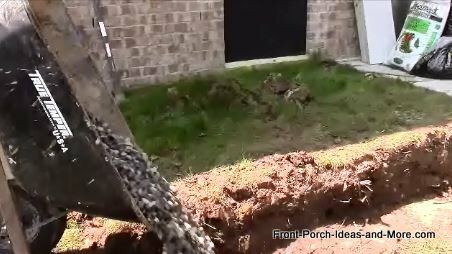 An actual French drain is basically a trench (or drainage pit) filled with gravel surrounding a perforated pipe into which water drains and then is directed away from structures. 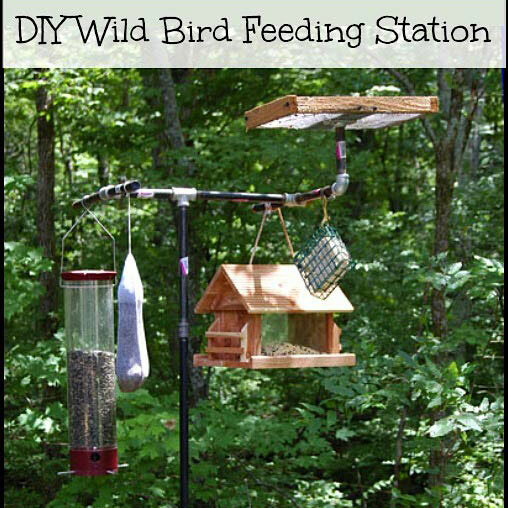 Disclaimer: I am offering this solution as one I am using to alleviate a drainage issue at my home. Every situation is different and no one solution is correct for every problem. We recommend you consult with a professional in your local area regarding your specific issue as results may vary. 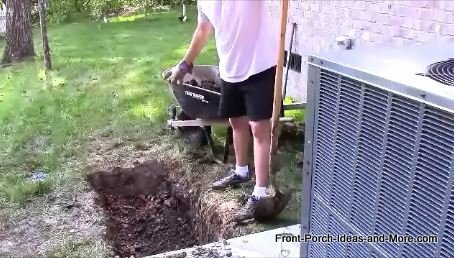 I recently resolved a drainage issue near our air conditioning system that could easily be used for a similar situation next to or near your front porch. Often times, homeowners encounter situations where water from down spouts cannot be adequately directed away from their home. Important note repeated: Be sure to call your utility companies and cable company to mark their lines before you dig. No one wakes up thinking they are going to have an accident that day. I dug a drainage pit, created a sump at the end of the trench, and then filled it with stone. This allows the water from the air conditioner to drain into the trench. The water then flows through the stone into the sump area where it will eventually weep into the surrounding ground. 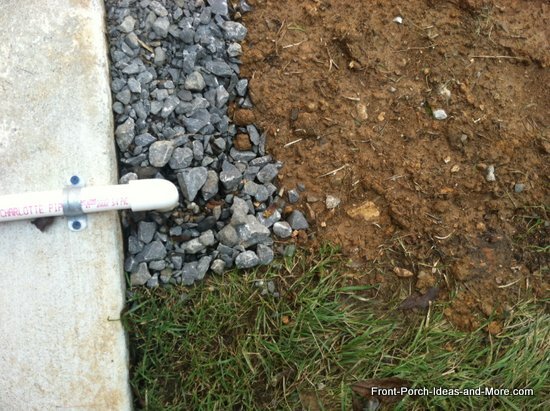 As stated above, be sure to have your utility company mark lines so that you don't hit them. Once that's done, safely dig a trench to accommodate the runoff. Determine the size and depth of your trench based on how much water needs to be diverted. 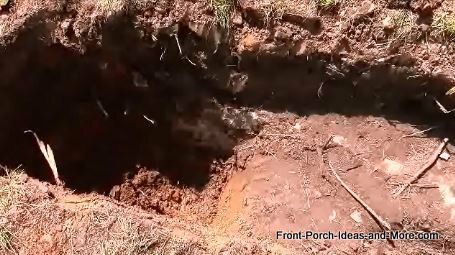 Your trench may have to be of considerable depth depending on the runoff flowing through your downspout. Also consider your soil makeup. If you have a lot of clay, it will take longer for the water to weep into the surrounding area. Therefore you would need a larger or perhaps deeper trench. In my case, I dug the trench about six feet long. I made it deeper as I went so the water would naturally run downhill. I then dug a sump at the end of the trench into which the water will fill and then weep into the surrounding ground. I filled the drainage pit with stone till about 4 inches from the surface. I filled the pit nearest the air conditioner unit to the top with stone into which I will extend the drain pipe. 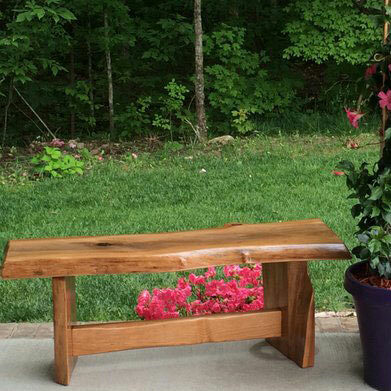 This also allows me an area into which I can use to direct water from the patio area on which the a/c unit sits. I filled the remainder of the trench with soil and seeded with grass seed. 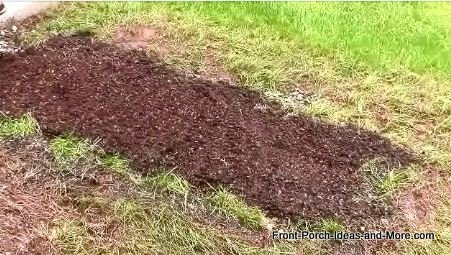 Again, this lawn drainage problem solution may be just the answer to your front porch or yard drainage issue. 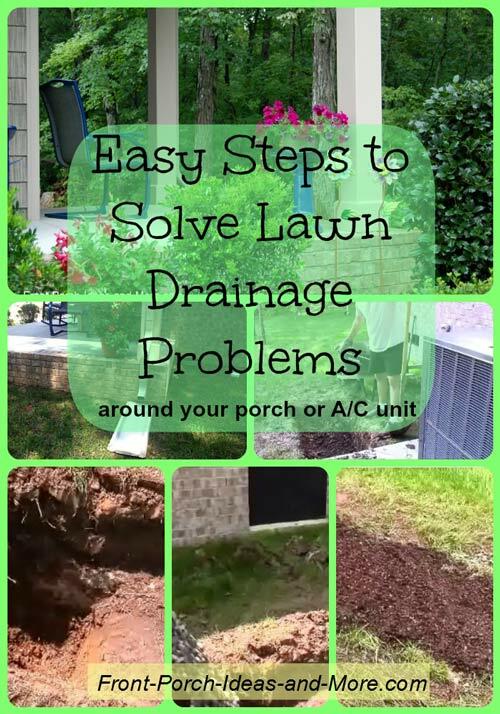 Send us pictures of your lawn drainage problems and how you solved them so we can share them with our site visitors.